When an abused husky was found, looking like a skeleton, one person decided not to give up on her. Ten months later, she was so completely unrecognizable that you can hardly believe it’s the same dog! Rico Soegiarto was on his way home from work one night when he came upon the shocking sight. Although his home, the amazing Indonesian island of Bali, is known for its beautiful forested volcanic mountains, iconic rice paddies, beaches, and coral reefs, it also has a huge homeless dog population. So, it’s not all that surprising to see an abandoned pup, but this particular dog was so malnourished, she hardly even looked like a canine anymore, let alone a majestic husky. In fact, the only telling sign left, as to what kind of dog she might be, was her blue eyes, which looked sad and afraid. 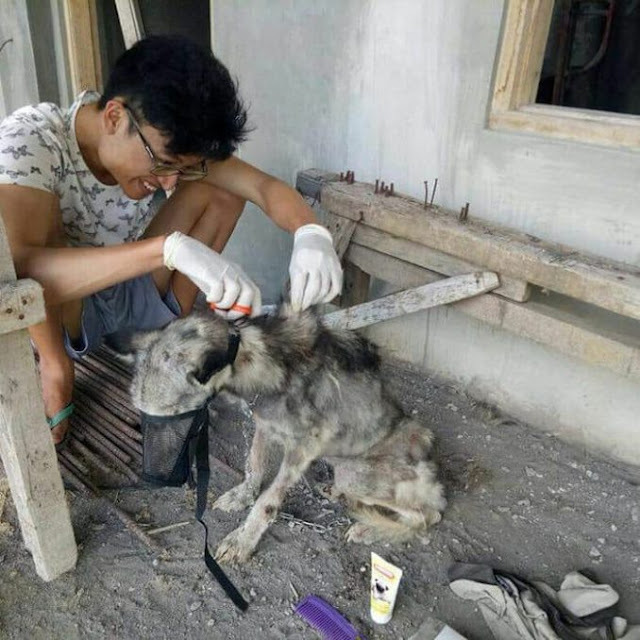 Although most would have taken one look at the skeletal dog and thought the situation was hopeless, volunteers in Bali have taken the homeless dog problem into their own hands since authorities have found it difficult to control. These animal lovers have made it their mission to give dogs like this one, who are poor, abandoned, and dying, a new lease on life. Rico Soegiart is one such hero who rescues these animals, so this is one lucky husky since it was Rico who encountered her on the streets of Denpasar. As we can see from the images, she was a terrible sight, so thin that her bones protruded from her emaciated body. Her demise appeared imminent, but Rico had other plans for this pooch. With the promise of life still shining in her bright blue eyes, despite her condition, Rico knew that he had to give the neglected dog a second chance. So, he spent the next 10 months looking after her, nursing her back to health. After being given a loving home, the dog slowly began to recover. She was properly groomed, had several veterinary visits, and plenty of delicious, nutritious food. 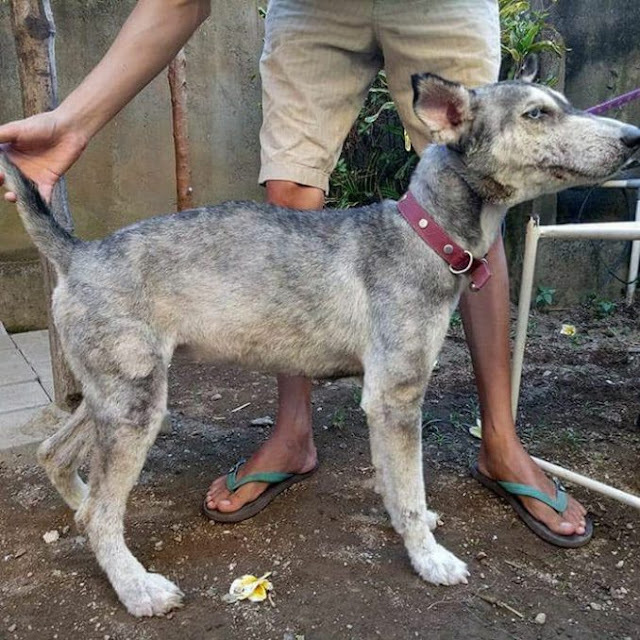 Rico also gave the husky, who had been abandoned on the streets of Bali, an appropriate name, calling her Hope, and her transformation is incredible. Thanks to Rico, Hope went from a depressing bag of bones to the gorgeous dog that huskies are known to be. Rico is very proud of his newfound friend and shared Hope’s transformation online. The images are amazing as she’s hardly recognizable. 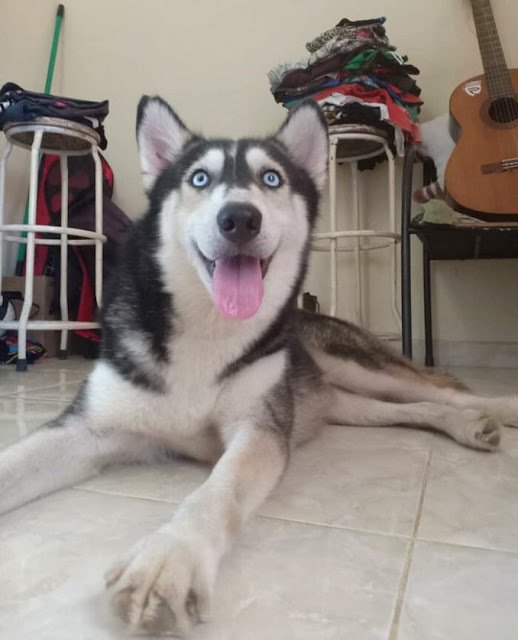 Today, Hope is a strong and healthy husky with a beautiful thick coat and dazzling bright blue eyes that now shine with happiness. 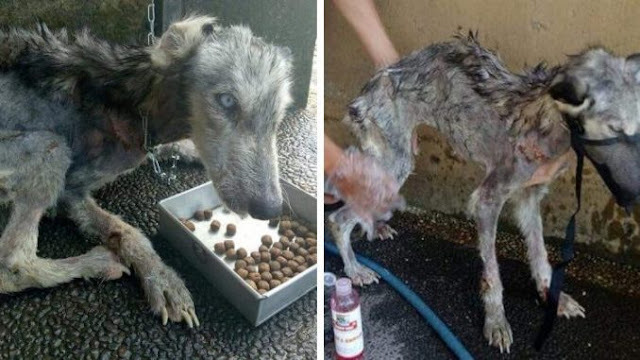 Her images give all new meaning to the phrase, “Don’t give up Hope.” Thankfully, when this pooch needed it most, 26-year-old animal lover Rico Soegiarto crossed her path and stopped in his tracks when he saw the malnourished dog who was so sickly she barely had any coat left. She may have been skin and bones, weak and frightened, abandoned on the streets of Bali, but that didn’t deter Rico from giving her the love and attention she needed. She seems to appreciate Rico and the second chance he gave her. “She loves getting petted and eats plenty of cookies!” Rico said of his beautiful blue-eyed friend. Although Hope didn’t seem to have many days left to live when Rico took her in, there was still life in her bright blue eyes and that glimmer of hope — no pun intended — was thankfully enough for Rico to immediately know that he had to give her a fighting chance despite her heartbreaking state. Her amazing transformation is one of the most incredible ever seen. “I do not know what was so special about her,” Rico said. “It’s about heart and feeling. I found her when I was on the way back home from work, she was in the middle of the street.” Thanks to Rico’s loving home, Hope recovered and is now part of a big, happy family with Rico and his girlfriend, who have 4 other dogs that they also saved from the streets. Don’t you just love a story with a happy ending?